Well, When you're on a roll... you're on a roll! When you're not.. well.. you're not! I thought I'd show you what I've been working on this summer! 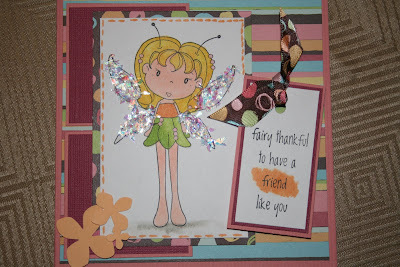 I had signed up for a couple of craft shows this summer, and had been furiously trying to churn out cards. 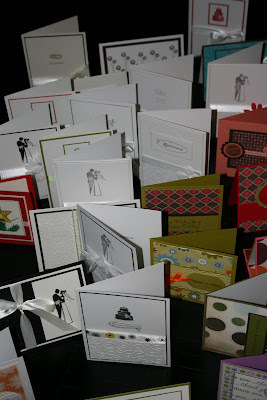 All in all, I made over 200 cards. I wish I SOLD 200 cards, but I did rid the stash of a number of them!! Here's a bit of a spread of some of the cards I made. I stuck to simple layouts and use up some of the DSP I have been hoarding. 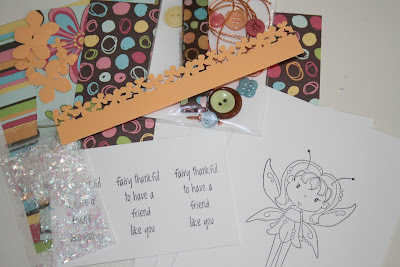 Now if I could only be so productive when I swap... or remember to send birthday cards... I would be golden. Here's one more spread, and shows some of the wedding cards I did up. 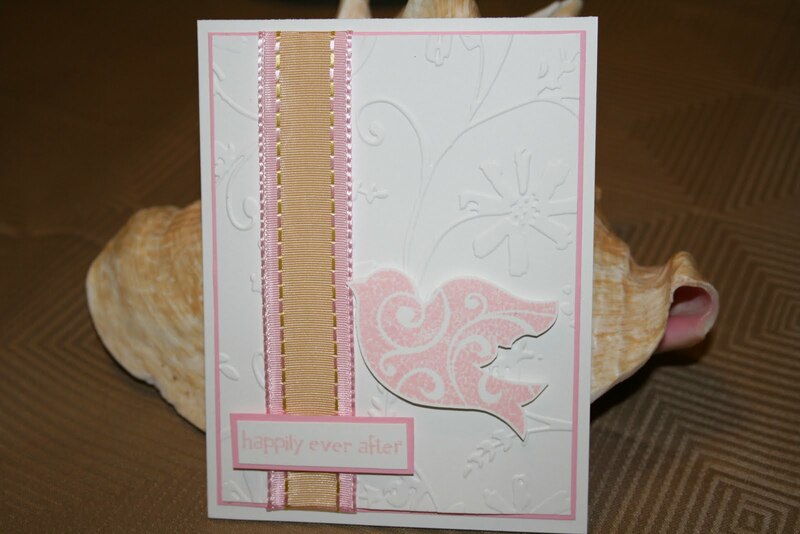 I completely am in love with the 5x7 size white bases for wedding and anniversary cards. In fact, I am in love with 5x7 cards period! I bought a whole whack of envelopes in this size, so I see some bigger cards in my future. What do you think?? Well, that's what I have been busy doing this summer!! A quick post today with a couple of things to share. I found this bird stamp in the dollar fifty bin at Michael's. There's another one that faces the other way with a different pattern on it and I picked that one up too so I'm working on a layout with the two birds. For now, here's something I whipped up. I'm just LOVING white card bases right now. 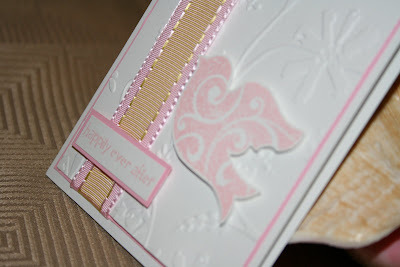 I am in LOVE with PTI's white cardstock since its so heavy. I wish I could find some locally as the shipping is insane! Some time ago, I made a couple of quick kid's frames and gave them to bf's cousin for her kids. They were in place of a birthday card to accompany birthday presents. They loved them! She sent a message not long after asking if I would please also make a frame for her step-daughter and so I was quite happy to oblige. 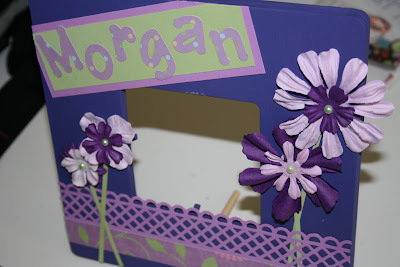 I picked up the frame at Michael's and a little tube of paint and anything I could find in my stash that was purple. I didn't want the frame to be too busy so i did up some flowers, used my new-to-me Sizzix lollipop dies for the letters and voila! I hope she likes it! (thought it will be some time before we see them next). Well, that's me for today! Thanks for stopping by! It has been so busy around here, which accounts for my lack of posting! 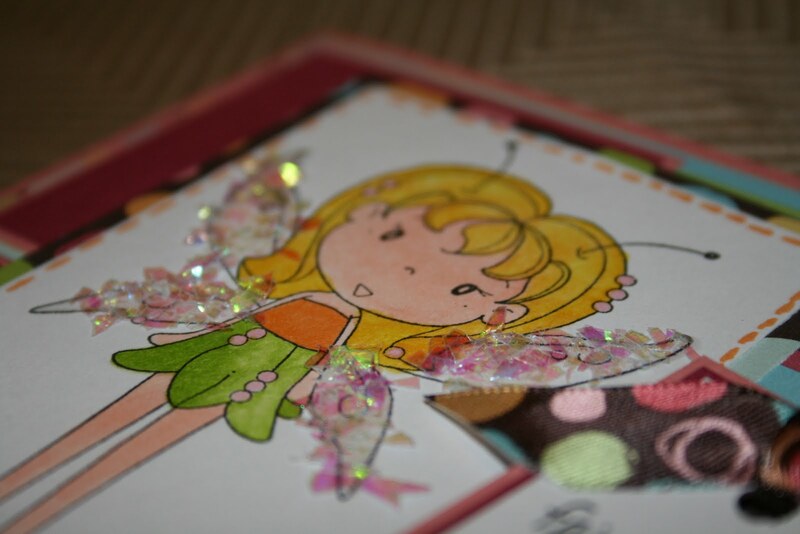 The kit consisted of a cute little fairy, and sentments - with some great papers and embellies... I pulled out some copics and here is what I ended up with.. whatcha think? I went a little outside of my comfort zone. 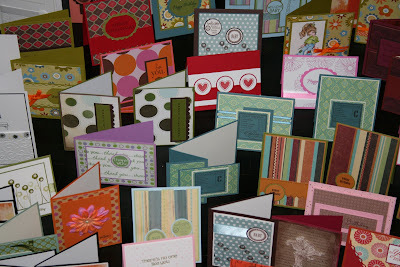 I realized when looking through old cards that i'd made, that I rarely use more than one design of patterned paper on my cards. Well, this lovely kit helped me get over that one! Don't you just LOVE the matching ribbon?????!!!!!! Thank you to all the kit swap hostesses over the last oh.. year and half I guess....!